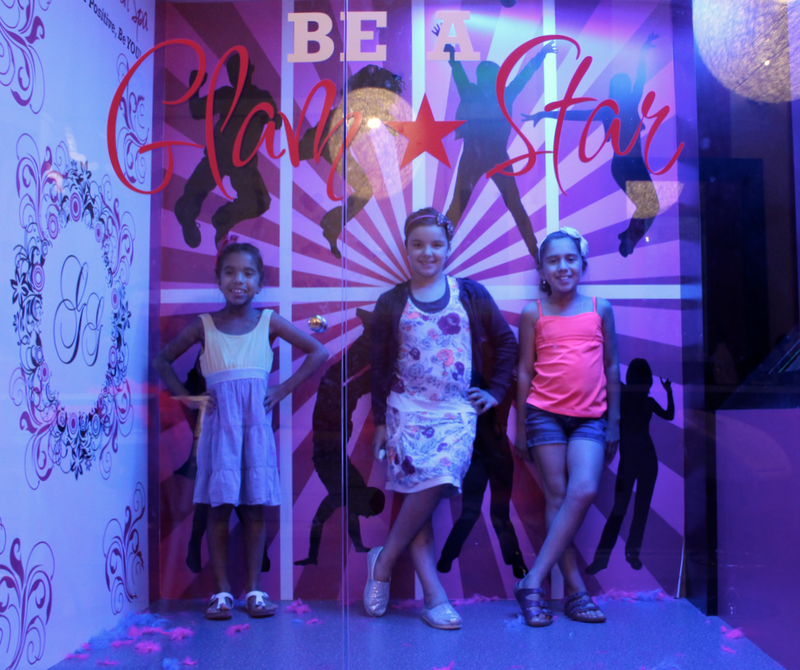 As a Glama Gals Tween Spa glambassador, I couldn't have been more delighted to have received a special invitation to attend the Glama Gals Back to School Glam Jam a few weeks ago. 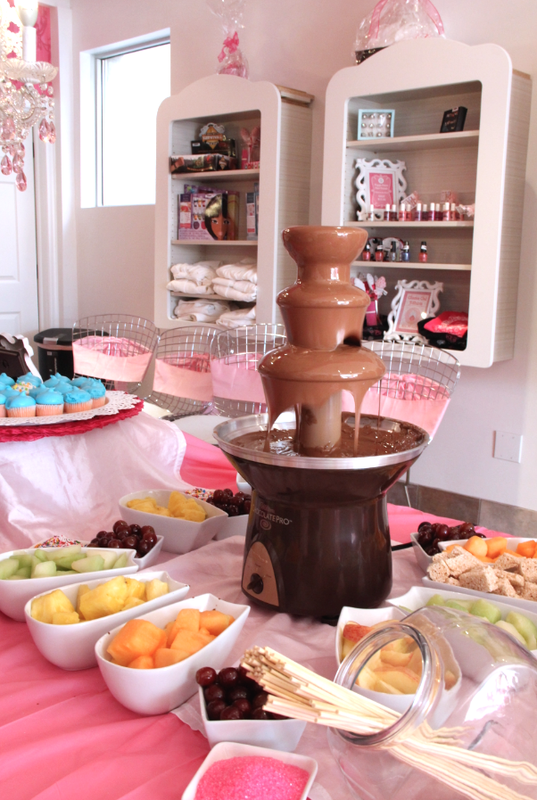 Quite frankly, they had me at "chocolate fountain." 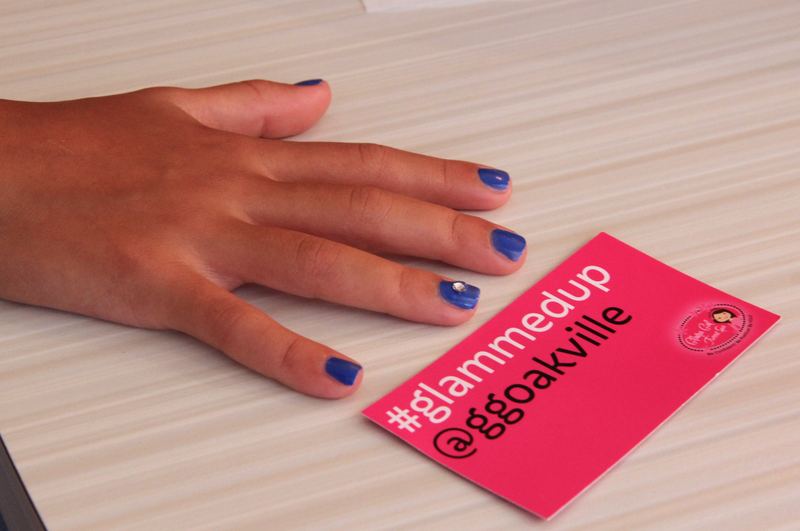 From the moment I walked into the Glama Gals Oakville location, it was like the heavens had opened up and showered the place with angelic treats and divine sweets. 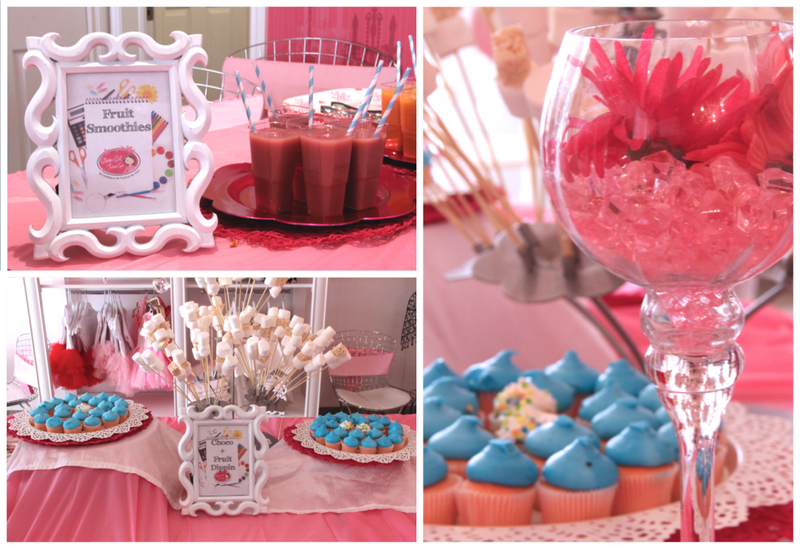 There were fresh fruits, marshmallows and rice squares for dipping, adorable mini cupcakes that were too cute to eat, and fruit smoothies to wash it all down. These ladies sure know how to throw a party! My daughter and I headed upstairs to meet my friend and her two daughters who joined us as our special guests. The two-level location was very unique in comparison to the Glama Gals Toronto location. 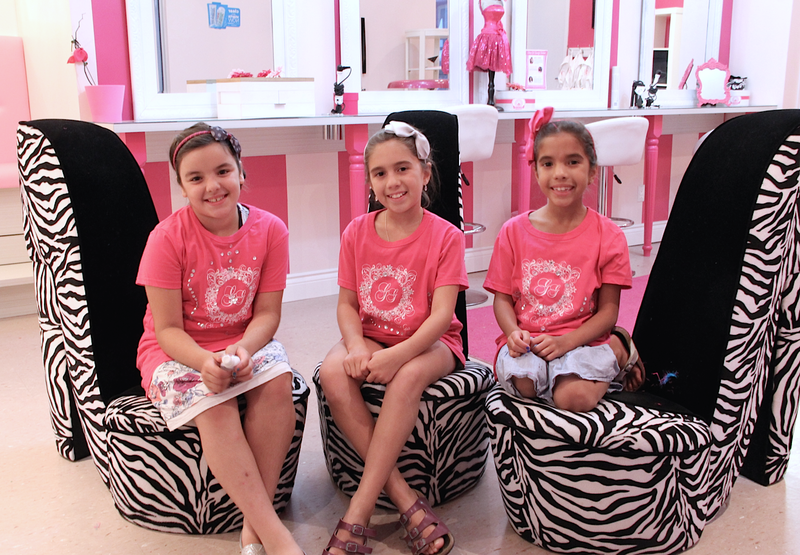 Yet, the stunning decor mirrored the same hot pink, black and white theme that you will find at all Glama Gals locations. 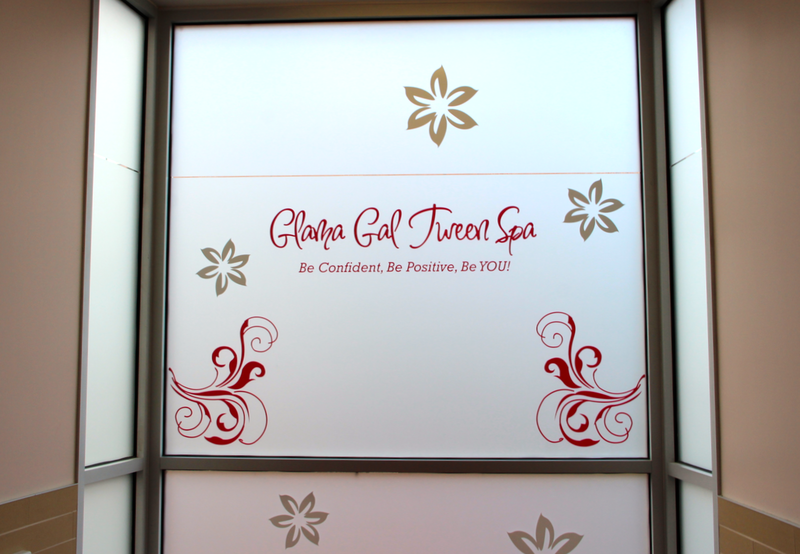 There is even a feature wall where you will find the Glama Gal Sisterhood Oath. And don't you just love the fabulous chairs? First up for the girls was a lavendar facial where they were able to relax and allow slices of cucumbers and lavendar spray to work their magic. Following this was a special 'do at the braid bar. Each girl was also invited to selected from a pretty assortment of headbands with bows. Next up was the nail bar. The girls selected their favourite colours and chose a special design for added bling on their ring fingers. Once their nails were dry, they headed over to the craft corner where the lovely Deborah Lowther of Raising Healthy Kids was helping out that evening. 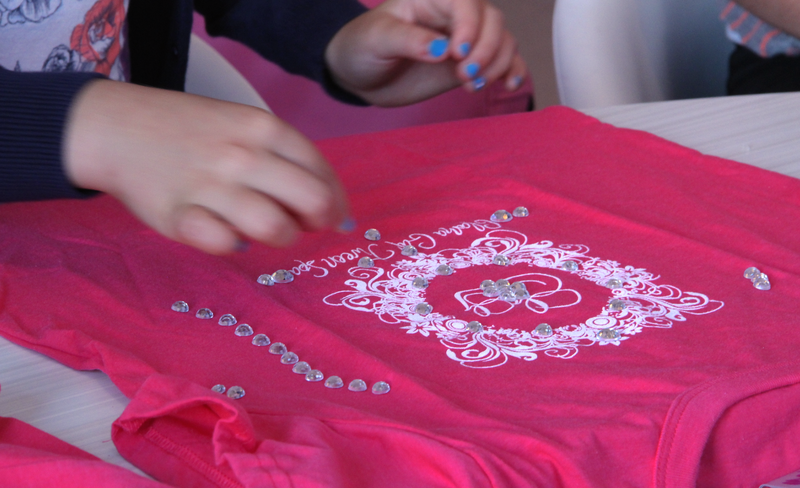 Every glama gal received their very own Glama Gals t-shirt which they were able to bedazzle with shiny rhinestones. While waiting for the glue to dry, the girls mixed their own perfume spritz, all the while giggling and squealing like a bunch of school girls. Wait. They are school girls! Then they played with costume accessories and headed into the one-of-a-kind Glama Gals karaoke booth. Who could resist an open invitation to be a Glam Star? Towards the end of the evening, Glama Gals Tween Spa founders and sisters Josie and Laura spoke to the girls, encouraging them to be confident, be positive and be themselves as they head into a new school year. It was hard not to get excited about Back to School after listening to their positivity and enthusiasm. Once the party was over, it was time for the glama gal tweens to don their bright pink shirt and smile for the camera. They each walked away with a special #Glambassador school bag filled with some school supplies to get them pumped for the big day. Speaking of pumps, where can I find me a plush zebra print stiletto chair? Anyone? It costs $80 Per Mom and Daughter Duo and will take place from 7pm - 9pm. Disclosure: I am a Glambassador and receive special perks as part of this affiliation. Any opinions expressed in the post are my own. Nice!! It's nice to treat the girls like young ladies. I'll be there for the cupcakes. The cupcakes were good. But the chocolate fountain... Oh. Em. Gee! It sure was! A great opportunity for some BFF bonding time, especially since we live an hour away from each other. The girls had a blast indeed! It really was. So pretty and such friendly staff! Love the set up! Will have to check it out sometime! Those shoe chairs are FAB! So much pink! This place looks like a blast! What a great business idea.